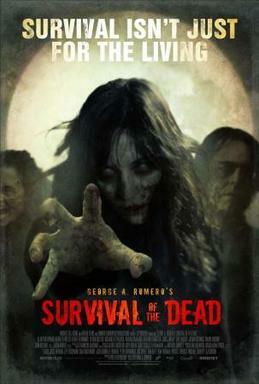 Here is the review of "Survival Of The Dead." Synopsis - Survival of the Dead takes place in a desperate, nightmarish world where the dead walk the earth, relentlessly attacking the living. It is the story of Plum Island - a beautiful refuge whose isolation allows two powerful families to maintain a semblance of order in the wake of the zombie holocaust. But as the inhabitants slowly die off, the two clans become sharply divided: The O'Flynns believe that the undead must be destroyed without exception, while the Muldoons insist that afflicted loved ones be kept "alive" until a cure is found. Into this situation wander a small group of National Guard troops who have decided to strike out on their own in an effort to survive.